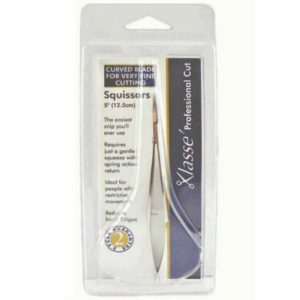 Thread Snips and specially designed scissors for buttonholes, embroidery and other craft applications are all available to help craftsmen of every level achieve high results easily. Enjoy the advantage of these specialty scissors for ease of use in your special projects. 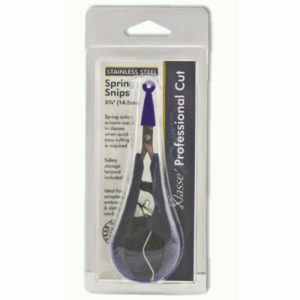 Strong stainless steel spring loaded thread snip with very sharp blades. 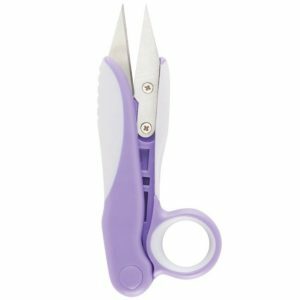 Soft touch base and finger grip ensure this is a comfortable snip to use. 125mm/5in. Klasse – professional range, 5 3/4″ spring snips with optional spring release reduces hand fatigue stainless steel blades grounded to a fine point for precise cutting. Removable lanyard to place around neck for convenience. 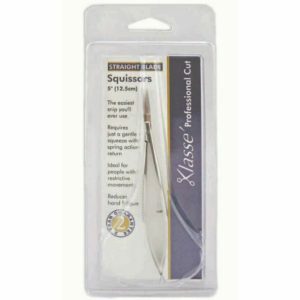 These Klasse thread snips have super sharp blades and an ergonomic arch spring design. Available in orange, green and pink. The easiest snip you’ll ever use. Requires just a gentle squeeze with spring action return. Ideal for people with restrictive movement. Reduces hand fatigue. Very sharp points for fine work. Finely ground blades make these scissors ideal for snipping and trimming, in addition to normal fine embroidery work.